Every fall, the federal government releases the findings of the FBI Uniform Crime Report. When news outlets and elected officials start issuing their own interpretations of these crime statistics, residents of certain cities may wonder if they should head for the hills. What’s needed here is perspective, along with context. Even though the FBI cautions the public about jumping to conclusions, misunderstandings can still occur. For example: When you look at crime statistics by city, be sure to factor in population. A large metropolitan area may report a greater number of burglaries than a smaller city but actually have a lower burglary rate per resident. 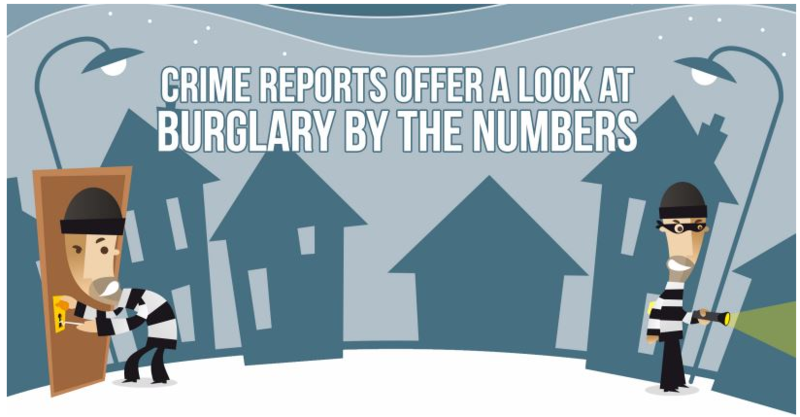 To help you understand what crime reports about burglary and other offenses truly mean to you as a homeowner, Adtsecurity.com offers the following “Burglary by the Numbers” graphic. You’ll see how the nationwide number of burglaries has declined while the financial impact on victims has grown. How prevalent is burglary in the United States, according to crime reports? How has the popularity of personal electronics influenced the items targeted by burglars? Use the information in this adtsecurity.com resource to make an objective decision about FBI crime statistics, a decision informed by perspective and context.